RRMM Architects is truly grateful for the sacrifice that our veterans have made for our nation. In honor of Veteran’s Day, we’re looking back on two projects we’ve designed for injured veterans. 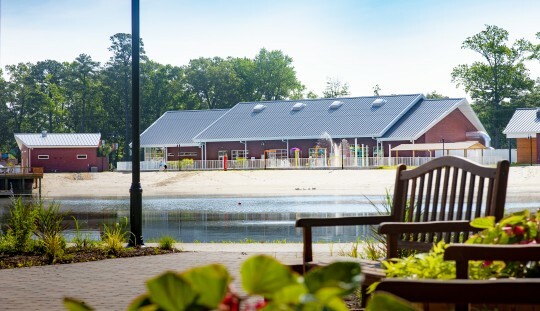 The Aquatics Center at JT’s Camp Grom Adventure Park is a 70-acre Virginia Beach facility which is 100% handicapped accessible and the only facility of its kind on the east coast. The center is designed for wounded veterans, adults and children with special needs, as well as their families. The Center is comprised of a main pool area flanked on each end by two separate, yet integrated wings. The indoor pool area is approximately 11,627 SF and is enclosed with a pre-engineered metal building skinned with red Hardi-Plank siding. In order to provide the desired open flow between this indoor pool and the immediately adjacent outdoor splash park and lazy river, large overhead rolling glass doors line the front and back exterior walls. Within this structure are a wheelchair accessible 25-meter main pool, small lap pool, and pre and post swim rinse shower station. 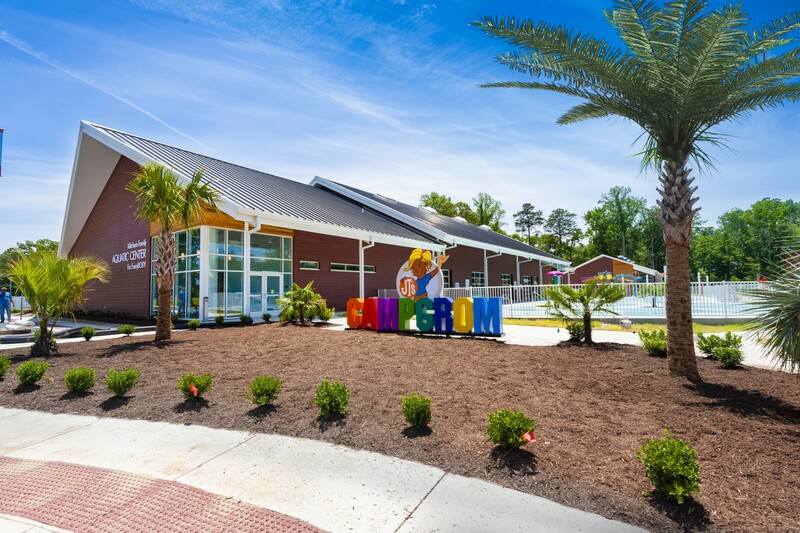 The conceptual design of the Aquatics Center is intended to retain the overall Camp Grom theme which is a beach surfer-type design aesthetic consisting of exposed wood soffits and exterior columns, lapped siding, and metal roofing. The Wounded Warrior Hope and Care Center provided a headquarters facility in conjunction with a physical rehabilitation and fitness center at Camp Lejeune, NC. The goal of the Center is to provide a facility that inspires and supports the desire of injured and wounded Marines and Sailors to achieve their goal of rehabilitation and transition back to active duty or separation from active duty. The facility consists of two functional areas; an administrative support/ resource center for the Wounded Warrior Battalion Marines, Sailors, and their families and a physical rehab/fitness center. The Battalion Headquarters/Administration facility is connected via a covered portico to the rehabilitative center. The Hope and Care Center includes an indoor aquatics area with a therapy pool, lap pool, pool equipment spaces, locker rooms, dedicated HVAC system, human performance assessment area, therapy/workout areas with associated equipment, a climbing wall, and an indoor track. Administrative areas within the center include an informational resource library, a transition center, a call center, counseling offices, medical case manager offices, conference and training rooms and other administrative offices. This facility also includes a drive-up, covered personnel drop-off and loading area, along with the golf cart storage shelter. We thank each and every veteran and look forward to continuing to serve them in the future!